(Palo Alto, Calif.)—Peninsula Open Space Trust (POST) announced the purchase of a 96-acre farm along Highway 1 on the San Mateo Coast, just south of Pescadero. POST purchased the property for just over $3.3 million from the Cordes family. The acquisition is a part of POST’s Farmland Futures Initiative (FFI), which aims to triple the number of farms and farmland acres permanently protected on the San Mateo Coast for open space and agricultural production. “POST has done so much towards preservation of coastal farmlands and open space over the years, and we are truly honored and relieved that they are the final buyer of this property, with the end use of permanent un-developed open space for the public to enjoy forever,” said property seller, Rick Cordes. Situated on Highway 1, directly across from the popular Bean Hollow State Beach, the property is highly visible and lies within a State designated scenic corridor. POST’s purchase of the property will ensure that the view shed afforded by the property remains unhindered. The majority of the property is designated as prime soil, the best possible soil for growing crops. As such, POST plans to keep the land in production by continuing the lease with the existing tenant, the Marchi family. 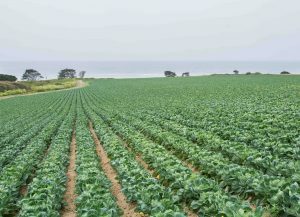 This long time local farming family currently grows Brussels sprouts, leeks, fennel and other coastal crops on more than 60 acres of the farm. Longer term, POST plans to sell the property to a private farm operation subject to an agricultural easement. Coastal recreation opportunities could potentially be expanded through this purchase. Building a trail on the perimeter of this newly acquired farm, along Highway 1, could fill a gap in the California Coastal trail. The California Coastal Trail already runs through a portion of another POST protected farm, Cowell Ranch in Half Moon Bay. “It was wonderful to work with a family that truly cares about the health of the land and understands the incredible benefits their farm provides the community. We are thrilled to have completed the conservation of this property with the Cordes to permanently lock in these benefits for the well being of the area,“ said POST President Walter T. Moore. The acquisition of this 96-acre property brings the total number of farms protected through FFI to four, and brings POST closer to its goal of protecting 22 farms by 2026.